Site Equip are liquid waste removal experts emptying toilets, cess pits and septic tanks since 1988. With our large range of tankers all projects are possible, including difficult access. We are licensed by the environmental agency to legally tip in sewage works across the South of England efficiently and safely. Additionally we can provide you with a waste transfer document to prove your waste has been disposed of legally, ensuring you are always dealing with professionals. 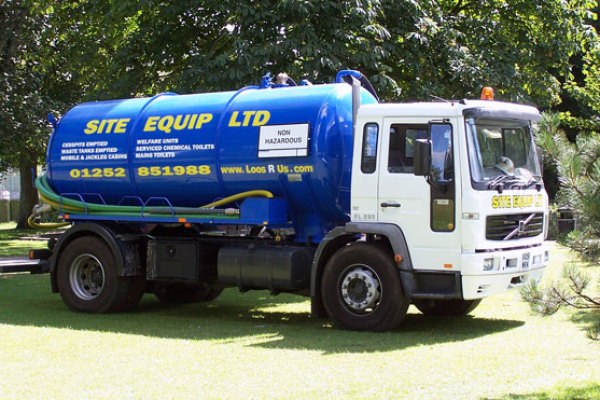 Our liquid waste removal tankers range from 100 gallons to 2000 gallons, on vehicles from Land Rovers, Mercedes Sprinters and HGV vehicles which means we are able to offer the most flexibility to you as the client. We are able to access toilets on tough terrain and empty 2000 gallon sceptic tanks in the centre of London. Liquid waste removal can be carried out across the South of England by our team of highly qualified service operators, they have all completed the NSQ (National Sanitation Qualification) level 1 ensuring your effluent is always removed legally, safely and efficiently.